Drain-to-Source Breakdown Voltage (VGS = 0V, ID = 250uA): 55V min. Breakdown Voltage Temp. Coefficient (Reference to 25�C, ID = 1mA): 0.058V/�C typ. Static Drain-to-Source On-Resistance (VGS = 10V, ID = 25A): 17.5mΩ max. Forward Transconductance (VDS = 25V, ID = 25A): 19S min. Drain-to-Source Leakage Current (VDS = 55V, VGS = 0V): 25uA max. 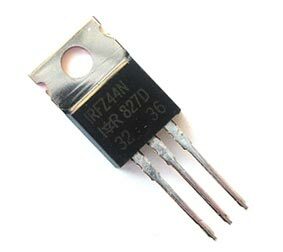 Input Capacitance (VGS = 0V, VDS = 25V, � = 1.0MHz): 1470pF typ. Output Capacitance (VGS = 0V, VDS = 25V, � = 1.0MHz): 360pF typ.